You've found the “U.S. Serama Chicken Breeders” page here at Hobby Farm Wisdom! If this is the first time you have visited our site: Welcome! The Serama chicken is a relatively new breed of poultry originating in Malaysia and is the smallest breed of chicken in the world. The main reason for breeding this chicken is ornamental, since it has an extremely friendly temperament and loves human contact. Due to their size though, they do not fare well in cold temperatures and need additional protection. While Serama chickens will produce eggs, they are quite small taking an average of 5 Serama eggs to equal 1 Grade AA large egg. 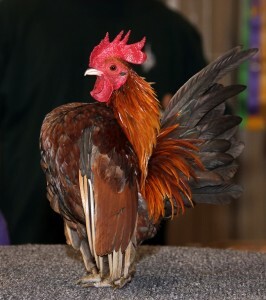 There are a large variety of colors documents but all Serama chickens are characterized by an upright posture with vertical tail feathers held tight to the body and vertical wings that practically touch the ground.